I made this using the leftover Whipping Cream I had after the cake I did for my MIL. You don't need an Ice cream maker for this. Coz I don't have one. 1. 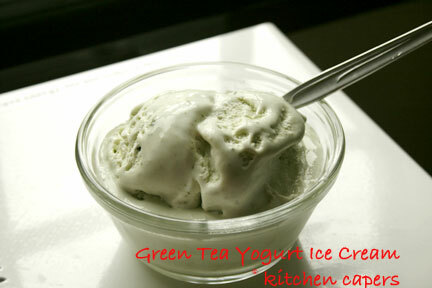 Whisk yoghurt, cream, sugar, green tea powder in a mixer till well blended. 2. Pour into container and freeze overnight. 3. Serve it the next day..! Gina, is the texture creamy or a little like sorbet? its creamy. a bit like the McDonald's Vanilla ice cream! I ever made ice cream but remember using smoothie powder. It does not seems to be an essential ingredient here? what essential ingredient is that? This is made without any special machine or powder. The other one I use to make was to use Coffee mate creamer powder. But that one more work. It needs to be boiled, and add gelatine powder to help it to set better. May I ask whether whipping cream is the same as whipped cream? If so, can I use those instant whipped cream from spray bottles sold in supermarkets? If not, may I know how do you make whipping cream? Thank you so much for your guidance!! its liquid form..not in cans. If you use the spray types, the ice cream may not form. whipping cream cannot be 'made'. Its often sold in packs and liquid. Like milk. Just whip till it peaks. Thank you Gina for your prompt reply. Hmmm.. I'll try and look for it in the diary section this weekend! !